This floral cardigan calls to mind the beauty of the classic Japanese Kimono while the print adds a vintage flair to your wardrobe's newest addition. Light, almost sheer fabric is suitable for any time of day as the weather begins to warm up and the breeze offers a welcomed cool down. The sleeves fall just at the elbow, being a bit longer in the back to stay aligned with the classic style that is this beautiful blouse. 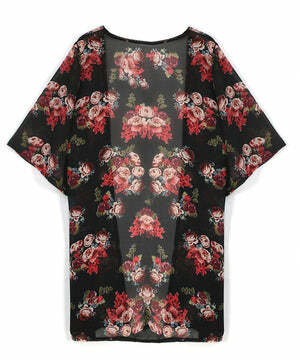 The red rose print definitely blooms against the rich black fabric. Wear it anywhere!